A musician, a teacher, a rescuer. The world lost a wonderful human being. Hania lost a loving father. On 30 December 2001 he went to help victims of an avalanche together with his Tatra Volunteer Search and Rescue team. It was his last mission. A scout, a musician, a Tatra Volunteer Search and Rescue worker - this inscription on the tomb in the na Pęksowym Brzyzku cemetery in Zakopane does not fully reflect the extraordinary life dynamics which characterized Marek Łabunowicz. Despite living only until 29, he became an icon of the region, a role model for the young and a pride to older Highlanders. He was everywhere since his youngest years. The school, the church, the scouts, sports clubs, cross-country and Alpine skiing, mountain races, climbing, speleological club, etc. Nearly every important institution and community knew Maja, as that was his nickname. He was everywhere and he was open to everyone. He was remembered as a very cheerful and always smiling boy, most often carrying a musical instrument. Apart from his personality features, he got a special gift from God - absolute pitch and extraordinary manual skills. Whatever he touched, it played in his hands. The violin, the piano, the guitar, the pipe, the organ are just the most popular instruments he played. However, he was made famous by the fact that he brought the skill of playing the Hungarian dulcimer to Podhale and was a true expert in it. He used to play with Edyta Geppert, the Golec brothers, Piotr Majerczyk, Jerzy Bek, Zbigniew Namysłowski, Maryla Rodowicz and many other well-known musicians and share his talent with the younger generation of Podhale’s community. Fascinated by highlander music, he taught group and individual violin lessons, often riding his bicycle in the rain into the inaccessible regions of Podhale. He lived the full highland life. He did not lose time for sleep. He shared and spread his happiness onto everyone he met. Everything he did was like service: the scouting service, the church service, he served by teaching the violin and working as a rescuer for the Tatra Volunteer Search and Rescue. On 30 December 2001 he went to help victims of an avalanche together with his Tatra Volunteer Search and Rescue team. It was his last rescue mission. Marek Maja Łabunowicz and his colleague died in another avalanche on the Szpiglasowa Przełęcz in the Polish Tatras. Marek left a wife and a daughter. Hania was four years old at the time. Today, she studies ethnology and cultural anthropology at the Jagiellonian University. Earlier, she graduated from Zakopane’s Plastic Arts High School, majoring in the lute. Just like her dad, she is fascinated by the culture of Podhale Highlanders, plays, sings, dances and makes musical instruments. Although she regrets that she knew him for such a short time, Hania is happy to have had such an extraordinary father and Marek is definitely proud of his daughter as he can be sure that “he did not wholly die” thanks to her. Ania is 20 today. She has been under our care since 2011. Despite adverse conditions and very little oxygen in a flat which caught fire, he went in to save the son of a terrified owner. He inspired his daughter to continue his mission on the fire service. He was much more emotional about the birth of his son than about defusing bombs. However, he did not live long enough to celebrate his first birthday. They first met when they were teenagers. Andrzej felt immediately that he had a deeper connection with Marzena. Despite his young age, he found it no problem to arrange for a family flat for them to live in. He had always been more resourceful than his peers, and more disciplined, sensitive and curious of the world. Since he had so many features of a great soldier, it is hardly surprising that military service became his passion. 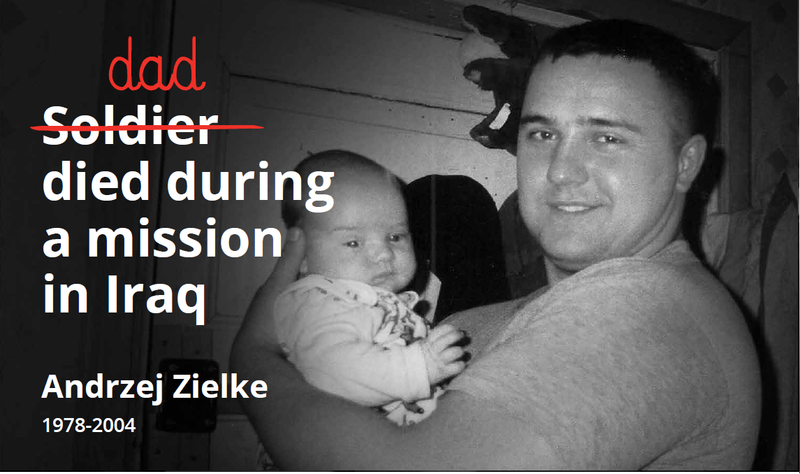 “If you love me, you will wait”, Andrzej said hugging his wife when he was leaving for a mission in Iraq. Although his heart was breaking at the thought of leaving his pregnant wife and three-year-old son Patryk, he could feel his calling. He had never been satisfied in the role of an ordinary soldier, he had always dreamt of special missions. And although night parachuting was extraordinarily exciting for him, Marzena was scared out of her mind when he was telling her his experiences on the phone. Undoubtedly, Andrzej loved his uniform but his sons were the greatest love of his life. When Eryk was born, the proud father would show his pictures to everyone he met. “The big guy was as happy as a sand boy, showed the pictures to his friends and was overcome with joy”, his colleagues from the regiment would recall. Unfortunately, he did not live long enough to meet his son and died during a mission. He is remembered by many as an exemplary soldier but to his boys he was someone much more important - a loving father. Patryk is 17 today. He has been under our care since 2011. Whether in uniform or not, Andrzej was never easy on criminals. That is why, when off duty, he stepped in when hooligans started demolishing a tram. Unfortunately, he was hit by a blade in the struggle and died from his injuries. “A spark is blinking at Wojtuś from the ashtray. Come, I'll tell you a fairytale, the fairytale will be long”, sang Andrzej Struj, Assistant Police Commissioner in the General Headquarters of the Police in Warsaw, to his beloved daughters before they went to sleep. And although all they have today are his memories, they both like to return to the time they spent with their dad playing. The girls also inherited their arts skills from him - Krysia has his vocal talent while Monika loves to perform on stage in front of audiences. 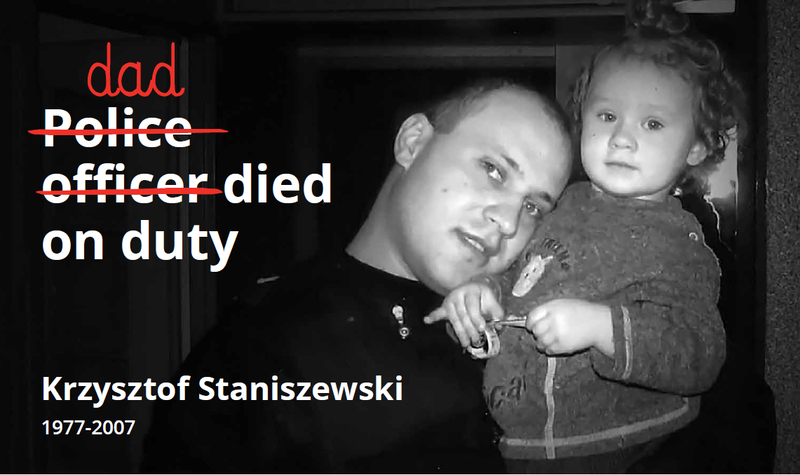 Andrzej was a great, patient and loving father to them. Also at work he was liked by his colleagues who considered him a good friend and a mentor. Despite his toned-down nature, smile rarely disappeared from his face and everyone could count on a kind word or piece of advice from him. Andrzej was also very active on a police forum where he shared his experiences from his 15-year service. “Struś” was known as a person who was very committed to the service and who made sure that law and order are abided also when off duty. In the past, he was member of elite group “Puma” which chased car gangs. Whether in uniform or not, Andrzej was never easy on criminals. That is why, when he was off duty, he stepped in when hooligans started demolishing a tram right in front of him. Unfortunately, he was hit by a blade in the struggle and died from his injuries. Although for many of us a model officer died that day, Krysia and Monika lost someone much more important. Krysia is 13 today while Monika is 15. They have been under our care since 2011. “Love grows around us…”, a little Patrycja climbs onto his father’s lap saying a poem. She is so excited, that she loses some of the words. In a few hours, her dad will be on duty again. Grzegorz Kordasz died in 2016. He took part in foreign military missions many times. Our dad was very committed to his service, and subjected all of his life to it. As his family, we understood and admired the fact that each day, with undying enthusiasm, energy and love for the Polish Army he performed his duties. In this passionate work, he was a role model for all of us, we were proud of him and were happy with his every promotion, distinction or praise. Everyday he taught us the values he himself believed in - honor, courage, honesty, hard work. He taught us not only with words but mainly with his own actions. By watching how he approached each of us, his co-workers and his military service we could develop our own value systems and base them on a solid foundation. Our dad’s commitment to the Polish Army was connected with the fact that he was often away from home and we missed him, especially when he was on foreign missions. Although we understood that this is his job, we missed him and did not want to part with him. Dad was not with us during some of the important events in our lives such as the first communion, confirmation or baccalaureate exam - when our friends had their families to share those moments with, we missed our father, at the same time knowing how much he wanted to be with us then. As his only daughter, he was my role model of a father and a husband, a loving and caring man who did everything he could for his family to have everything they needed and feel safe. I cherish every moment I spent with him and its memory, especially given that it will never happen again. Looking from today’s perspective, I regret that I had so few of those moments. Nothing and no-one will be able to replace my father, however I know that everything he taught me throughout my life lets me be who I am today. Therefore, I do my best to follow his values. I know that dad was proud of his children, he supported us in our activities and did not want any problems to disturb our education and development of our passions. Patrycja is 23 today, while her brother Michał is 10. They have been under our care since 2016. 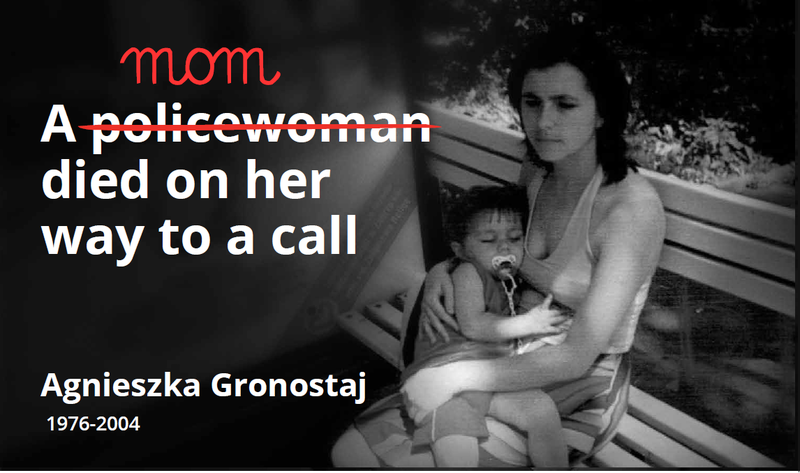 Rafał’s mum had just bought lunch from a store not far from the police headquarters, and then got a call requesting response to domestic violence. The patrol never got there. Another vehicle hit their car. “I do not remember my mum very well but thanks to the stories my grandparents told me, I know she was a wonderful human being and I will always remember her as such”, Rafał says about his mother. Agnieszka Gronostaj graduated from a medical high school but she could not find a job. Wanting to help people, she decided to join the police. She worked for 5 years in the prevention department. She would often say: “I am going to work, I might not come back.” When she was coming back she would always bring a small gift for her son - as if she sensed that they did not have much time. Agnieszka agreed to be an organ donor, therefore it is possible that her heart still beats somewhere today. Rafał is 17 today. He has been under our care since 2012. Julia’s father was a soldier. He died on a mission in Afghanistan. An IED exploded under the vehicle which he was driving. Although seriously injured, he tried to save his friends and take them out of the destroyed vehicle. 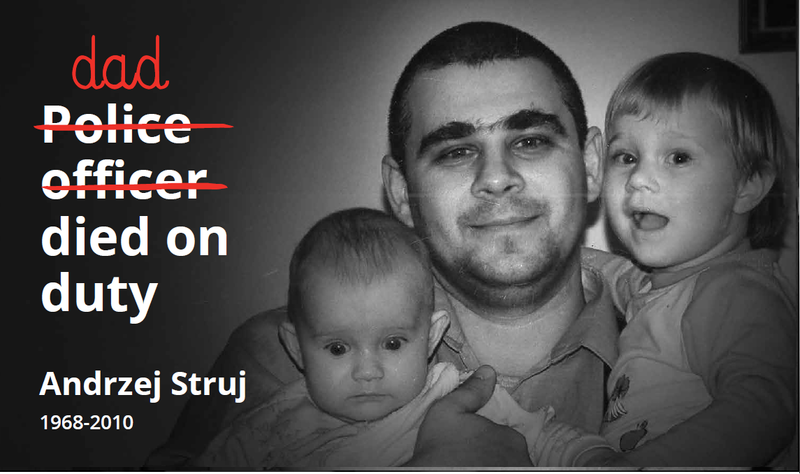 To Mariusz Deptuła, his family had always been always the top priority. Every person who knew him said similar things about him: open, warm, a good friend, a good soldier, a father who loved his daughter very much. Work in the army was his passion, bringing him fulfillment and numerous praises. He loved animals, especially horses. He was also a keen fisherman, trying to convince all his friends to take to the sport, and taking his wife and daughter fishing. The birth of their child brought great happiness to Mariusz and Iwona. The father’s love for his daughter is reflected in the vast number of family photographs: dad and Julia having ice-cream, dad and Julia at the zoo, on the lake, in the park... he spent every minute of his free time with her, although he did not spend much time at home. It was as if he sensed that they did not have much time. Julia remembers her dad, but she cannot recall his voice. They often come back with her mum to recordings from their wedding day and her mum often tells her stories about her dad before she goes to sleep. On 23 October 2011, a Wolverine column was going back to base in Ghazni. An IED suddenly exploded under the vehicle which Mariusz was driving. He tried to save his friends and take them out of the destroyed vehicle. Unfortunately, he himself did not survive long enough to get help, although he was conscious when taken away. His injuries were too extensive. Julia is 8 years old. She has been under our care since 2013. Krzysztof had always had a feeling that he would die young and often told his wife about it. That day, the police car he was driving to chase robbers was involved in a collision with another emergency vehicle. (…) Krzysztof often talked about death. Not jokingly, always seriously. He was talking about it ever since they first met. And it happened when they were both in primary school. Patrycja was 13, he was 15. They became a couple already at that early stage. One day she returned home all agitated and said that Krzysio said that he would not live long and when he dies the whole Poland will come to his funeral. In May 2007, generals, politicians, officials and policemen came to his funeral and there were honorary salutes. They came to say goodbye to a thirty-year-old policeman who died in a car crash several days before. It was a chase, he wanted to catch burglars who had robbed a store. (…) Every time he returned from work he would tell us what happened. He was all shaken up when he intervened at homes where children were beaten up and maltreated. Other times it happened that someone drew a knife or axe at him or he was chasing someone and had a car block his way. He said that he saw death many times and repeated that he might not return from work. He told Patrycja where to bury him. (…) Zosia doesn’t remember her dad, she was slightly over two months old when he died. Anielka doesn’t remember him either. Zosia only knows the story of her dad. Anielka started to talk very late, when her dad died she could only say “mum” and “dad”. However, she was always fluent in sign language. During the first weeks after his death, right after she woke up she would say: dad? When her grandma told her that daddy was in heaven, she jumped out of bed and sprang to the balcony window. She looked into the sky, waved her hand as if she wanted to call her dad. The fragments come from the book “To be mature enough for death” by Magdalena and Maksymilian Rigamonti. Aniela is 13 today, Zosia is 11. They have been under our care since 2014. Olek and Karolina’s dad lost both legs, his spleen and function in two fingers of his left hand. They were driving with their sirens on. A lorry came head on… Although he loved serving as a fireman, he will not return to the job. On 17 March 2011, the fire service received a call: a human being needs to be saved. They started their sirens and went. However, they never got to the victim - the car they were riding was in a head-on collision with a lorry whose driver did not make way for an emergency vehicle. His friends tried to get him out of the damaged cabin... Sławomir Wilczyński woke up in the hospital. Without his legs. He cried for the first time in his adult life. “Jesus, I was so happy. I wanted to be on that job so much. Even when I was on holidays, I would miss my work at the end. If I could, I would return”*, he said. After the accident, he was visited by a man whom he had saved a few years before from a helicopter crash. He survived but he lost his leg. He came and he gave him hope: you can live with it. And he was right. 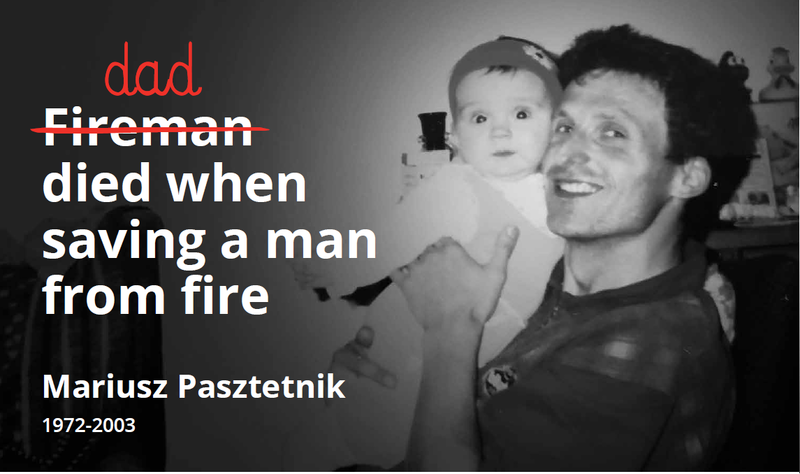 Sławek still considers himself a fireman. He thinks that he needs to return the good he got from people after his accident. He supports amputees and people who suffer from spinal injuries. He helps train rescuers who go on foreign missions. He plays wheelchair basketball, runs on special prosthetics, gives hope to those who do not believe yet that a life with a disability can be a 100 percent or even more life. His children Olek and Karolina say that they are proud of their dad. “Because he is with us. He did not break down”. *The quote comes from the book “To be mature enough for death” by Magdalena and Maksymilian Rigamonti. Olek is 15 today, Karolinka is 12. They have been under our care since 2013. 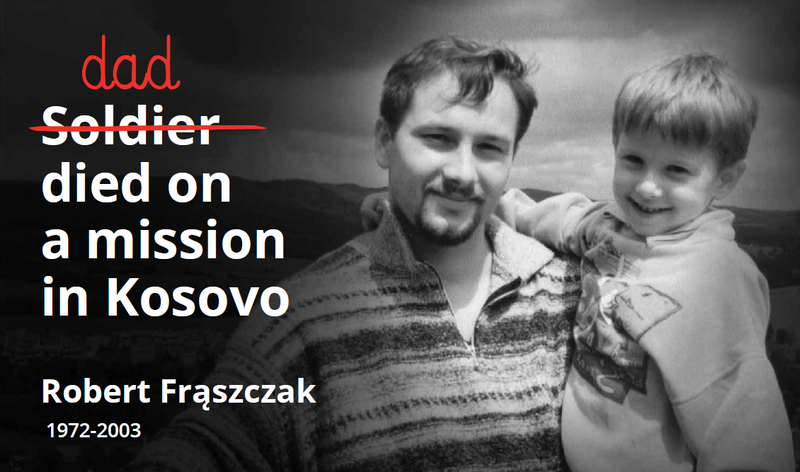 Kamil’s dad went on his first and last mission to Kosovo when his son was 7 years old. A talented soldier and a loving dad – an authority and a role model for Kamil who is an adult now. A man who left a void which is impossible to fill. He lost his life in a tragic accident on his way back to the country and to his son. My father, Robert, was born in 1972 in Bydgoszcz. He met my mum when he was very young, before he graduated from high school. He started his career in the military as a vehicle and tank serviceman in Piła, not far from his home town. Due to the fact that my dad was stationed in the 10th Opole Logistics Brigade, my parents decided to move to the almost other end of Poland. In 2002, my dad went on a PKW KFOR mission to Kosovo. He never returned home, he died on his way back from the mission to Poland. Although I saw my dad for the last time when I was less than eight years old, I can still remember the time we spent together and often return to those nice memories. I will always remember him as family and friendly man who never stopped smiling. He was an energetic person - we often spent our time playing football or biking - I was never bored with my dad. The period during which he was on the mission was difficult for me. I remember the long weeks of waiting for him to return. I wanted to surprise him and started learning his favorite Krzysztof Krawczyk song, unfortunately I never had the opportunity to sing it to him. My dad stayed with me forever in my heart and my memories. He did not have to be a great man. It is enough that he was a hero in the eyes of an eight years old. He has remained one to this day. Kamil is 23 today. He has been under our care since 2011.